How our door fitting service in London works? Book your door installation service online for whichever day and hour you prefer. A skilled handyman will arrive to unhinge your old door and check if the floor is leveled. The professional will take precise measurements of your existing door frame. He will bring all equipment and tools needed to neatly secure your new door in place. Hang the door and tightly secure it in place. When in doubt, ask away! The team will be more than happy to analyse your ideas and explain in detail why something may or may not work. And whether the task involves fitting a door frame, hanging doors, or door lock fitting, the final result will always be on par with your high expectations. 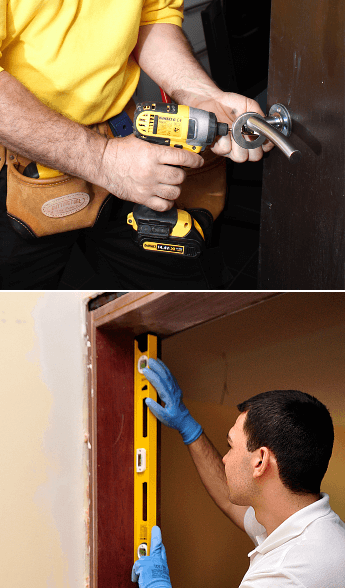 Use drills and other equipment to install door hinges, handles, and everything else. The minimum time for a single service is 1 hour. After it, you will be charged every 30 minutes. You pay upon job completion, for the actual time the technicians spent on site. Now you can get your new door installed by a pro and benefit from a hefty discount. Join the Fantastic Club for £59 a year and get access to all kinds of benefits, including priority booking for the most convenient time slots of the week as well as discounts not just for this but for every single service that we offer. Calling at lunchtime or even during the small hours? The knowledgeable and friendly online & phone customer support works 24/7 and will gladly help you book a session for any day of the week. Our service also covers all postcodes within the M25 area. All door carpentry work is performed in compliance with all British Standards and fire regulations. The swift and efficient experts possess the legal documents to work in the UK and to carry out anything from small lock repairs to fitting new frames and repairing front doors. The internal door fitters can work with doors of any type or material, such as folding & sliding doors, glass doors and wooden doors. In case you have a door that's too long to hang properly, the pros will trim the edges until it fits your door frame like a glove. They will also save you a trip to the hardware store by bringing all the screws, bolts, brackets, and knobs needed to get the job done. Here are some examples: Bi fold, UPVC, patio doors, oak, glazed and interior French doors. and more.